Just below the CTA’s Wilson Red Line stop, the old Wilson Broadway Mall is being demolished. It’s simply next in the line of surrounding structures waiting for the same fate. And this is just the preliminary stage of the station’s $203 million reconstruction project, which is funded 80 percent by the Illinois Jobs Now! program and the rest by tax-increment financing and the Federal Transit Administration. Between now and fall 2017, those in the station’s Uptown neighborhood will be used to construction workers and equipment on the 4600 block of North Broadway. The five-stage project, which officially begins after preliminary work ends this spring, calls for new platforms, temporary entrances and the demolition and reconstruction of four tracks for the Red and Purple Lines. This will cause streets to be closed and limited access between Wilson and Leland avenues. But despite the forthcoming headaches, Uptown residents and workers will put up them for future growth. 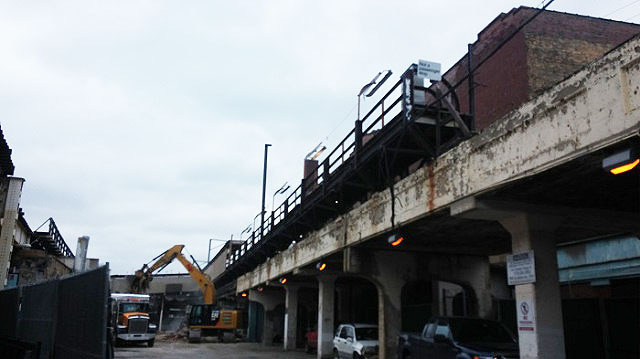 The Wilson stop has not been rebuilt since 1923, making this project long overdue. Even so, the firms involved with the work considered the community’s short and long-term views on the project. While the station will give riders such conveniences as improved access and access for customers with disabilities, many in the community believe its brand-new appearance looks to go a long way. They reason that simply looking at the facility could persuade people to return to the neighborhood more, thus increasing business at nearby establishments. It could be a boost they think Uptown has needed for some time. When the project is completed, businesses on the station’s block will no longer have to endure the sight of rail support columns on or close to the streets. And commuters will no longer have to stand on a wooden platform that had dangerous splits and gave way when boarding trains. However, the tracks’ demolition and reconstruction work will affect access to those businesses for one of the projects four years. Uptown Bikes is one of the closest located establishments on North Broadway and must be prepared for the pending financial setbacks. With the Wilson station and tracks located so closely to the streets and businesses, disruptions of both human and road traffic caused by the construction are inevitable. The CTA will attempt to make sure the work impacts daily life in Uptown as little as possible, but it knows what the neighborhood’s residents and workers will be subjected to. For Marcela Corrales, a 27-year Uptown resident and owner of the DA Spot Fashion Shop, the Wilson reconstruction project is making a better change for the community. It is one of the largest El station projects in the agency’s history, and the pre-construction work started several weeks ago. Barnes and Corrales are not the only business owners concerned about the impact. Ayman Atie, owner of Robby’s Communication, located across the street from the station, would like the project to move at a quicker pace. Atie may wonder about the long period of reconstruction, but he also cares about its pending impact. Ultimately, he believes the end result is going to make the neighborhood more appealing. However, one effect might not be so beneficial to those with lighter wallets. The lower-class struggle is just one issue in a neighborhood struggling to attract new residents. Joe Schwieterman, director of DePaul’s Chaddick Institute, blames a perception that north of Belmont Avenue, Chicago lacks the modernization many people look for. Uptown has also flipped between good and bad times, so without a major upgrade, it could face a bleak future. For now, one spark has come to George Goumas, the owner of Palla’s Grill just a few feet away from the Wilson stop. He mostly serves the hungry students from Truman College just across the street, but for the last couple of weeks, he has had new and even hungrier customers: the people working on the project. This is one of the main reasons he does not have a complaint about the approximately three years’ time that the construction is going to take. “For me, [it’s] better [and means] more business,” said Goumas. Since the construction started, Goumas has about seven or eight construction people that come to eat every day. Also, when the CTA stops the train service at the station, the bus working as an alternative for the route very likely will stop in front of his restaurant, which is fantastic news. So there are no bad things about the construction for this restaurant owner. As for the neighborhood, Goumas said he thinks the improvement of the station and the area itself will make it more attractive for people to visit and also safer. He is not concerned about the logistical problems the construction may bring to the area because he thinks is for the good and the result will compensate every disturbance the process may cause. The Wilson project will improve Uptown, which is a simply a bonus for the CTA. The main purpose is to make transit service easier for more people no matter where they live. Everybody who takes the CTA will appear to benefit from it as much as those who live around the station. Ultimately, the Wilson project intends to build a better life for Uptown residents and improved service for Red Line riders. That is why so many believe its completion will mark a rebirth in the area. The loss of the Wilson Broadway Mall and upcoming inconveniences actually signify a better future for all. * Photos in the infographic used with permission.